Food and Work. Work and Food. Over the last month, I have taken a service learning course at the UGA Costa Rica campus. Each day of work—has had the best reward, Food. And not just any food. I’m talking rich, bold, and flavorful. I’m talking luscious fruit, fantastic coffee and a lot more. Our first project was to clean, sand, and tidy the community cemetery and church in the tiny hamlet of San Luis. After working in the sun, we were all ready to sit in the shade to recover. We were ushered in to the side restaurant, where a bin of freshly cut fruit awaited us. Then, underneath a pile of paper towels were what suspiciously looked like doughnuts. So too were rows and rows of yellow colored, flat, wrap looking foods. The doughnuts were perfect, not overly sweet, as they are in the United States. And the wraps, called Empanadas, were filled to the brim with delicious black beans. On another day, we had tart and juicy slices of pineapple and sweet, pulpy watermelon. On one of our last days at the center, we had delicious Arepas Dulces which were pieces of lightly sweetened bread. Paired with papaya juice, it was heaven on earth. 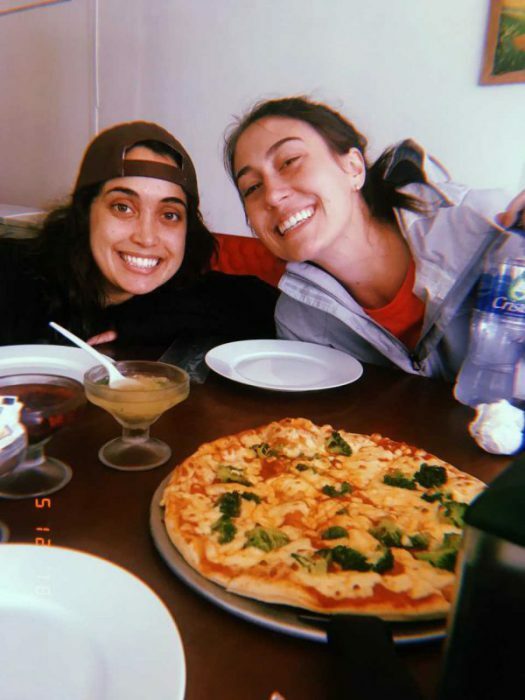 I thought the snacks in the community center were going to be the best local food I was going to have in Costa Rica, but then I began my weeklong homestay with a Costa Rican family. On a sleepy Sunday evening, the UGA bus drove me at the bottom of a hill to begin my homestay. I was left with my luggage, my appetite, and a hill to climb before I arrived the house of my family. One of the first questions I was asked as I walked through the door was “Tiene hambre?” which means, “Are you hungry?”. I replied with two thumbs up, and slid into the chair at the family dining table. The food every night was so tasty, from white salsa, rice and ‘carne’ with black beans, to garlic pasta and bread. If we weren’t talking about another family member or a friend, we were eating an ‘aguacante’ (avocado) from their garden or using a recipe from on the family’s book Always, after I ate, I washed my dishes in the sink and set them to dry. Full of food and of lively conversations in another language, every night ended in a heavy sleep. In a way, these family meals reminded me of my mother’s childhood. She grew up in the very rural South, waking up in the mornings before school to pick greens and other vegetables and returning in the evening to handle the livestock. To this day, there continues a tradition of Sunday meals being eaten in the house my grandfather built. Copyright © 2019 Environmental Communication at UGA. Proudly powered by WordPress.